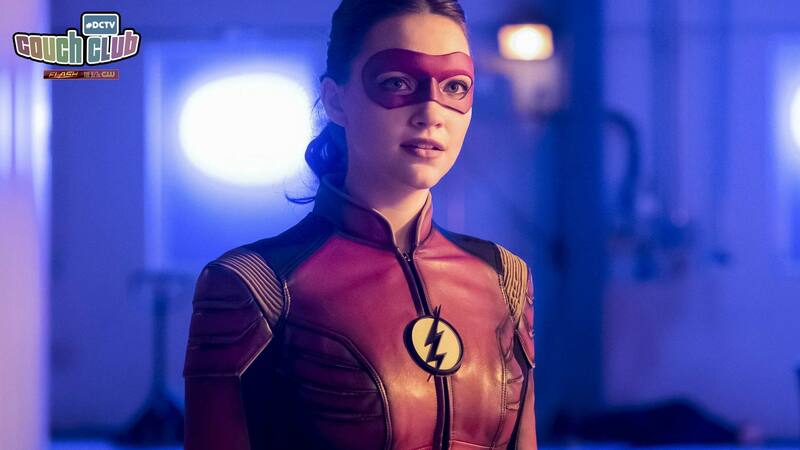 “Enter Flash Time” starts out the episode building on a concept that was introduced into The Flash television show during “The Trial of the Flash” arc. Here’s a fun #DCTV Secret: If you ever read any of The Flash scripts that you can find kicking around on the internet (I would seriously encourage fans of the show to Google these and give them a read because they are a truly fascinating peek behind the curtain), you know that “Flash Time” was the term the show’s writers used when referring to Barry and other speedsters, like Jay Garrick, Jesse Quick and Wally West, moving through the Speed Force as the rest of the world freezes around them. Over time, it then changed and evolved into Barry being able to move fast enough to bring other non-speedsters into the Speed Force with him simply through physical contact. It began with Barry touching Iris to keep her from outing his public identity to all of Central City and potentially the world beyond. It was only during “Enter Flash Time” that this unique ability was given a name. Flash Time isn’t just Barry moving at super speed, it’s basically him being the King of the Speed Force for as long as he can keep it up. Based on how sweaty he was at the beginning and the end of this episode, it seems like Barry maxes out around ten minutes time in the real world. It’s very interesting to me that this Flash Time ability was given to Barry, considering that it was created by Mark Waid and originated during his definitive run on THE FLASH when Wally West was bearing the mantle after Barry Allen’s death during the events of CRISIS ON INFINITE EARTHS. #DCTV Secret #2: The alert that brings Barry and Team Flash to the site of the nuclear bomb originates at Waid Airfield. As far as Easter Eggs go, I think this is a pretty cute one! If you dug “Enter Flash Time” and want to dive into the comics where it all began, you are in luck, my friend! DC recently started collecting Waid’s run on The Flash and you can scoop up your copy of THE FLASH BY MARK WAID right here. I always like to see where the things I love the most originated, and I’m betting you do too. In this comic run, Waid really works hard to define Wally West. He ascends to being a character who is truly separate from his uncle, Barry Allen. Living in the shadow of Barry’s legacy pushes Wally to break barriers—speed barriers and otherwise—throughout the decades that he was the one and only Flash. Wally is the first speedster to be able to vibrate his molecules through solid matter. He achieves the honor of being the Fastest Flash Alive, not just the Fastest Man Alive, AND he is able to reach the speed and level of speed-control that we see Barry doing throughout most of tonight’s episode. On-panel, this new ability is translated in much the same way that we see it on screen during this episode. Wally is flitting about all over the place, while everyone else in the world is just standing still. It’s not even that they are moving at greatly reduced speeds; they’re just not moving at all. For those playing along at home and doing their reading, this ability manifests around issue #150. It’s going to take some dedicated reading time, but it is 1,000% worth getting to. I promise you! The concept of Flash Time is not the only thing to happen in “Enter Flash Time” that was pulled from that Wally-West-as-the-Flash run of comics. In this episode, Barry says to Iris that she is his “lightning rod.” The notion of a lightning rod as a focal point isn’t new to The Flash. We’ve heard it tossed around for a couple seasons now. It is almost always brought up when Barry has to clear his mind and focus, and Iris is the individual able to facilitate this for him. However, this was the first time that he spoke the entire phrase. This sentence was lifted from Wally West. One of the reasons that Wally West is considered to be the Fastest Flash Alive is because he can run to the edge of the Speed Force and enter or exit it as he wishes. His girlfriend (later wife), Linda Park is consistently referred to as his lightning rod. She is the thing that ground him to the real world. Wally’s connection to Linda and love for her is so strong that she pulls him back from what was effectively death when he reemerges into the current DC continuity in DC UNIVERSE: REBIRTH. This coupled with the fact that Wally and Linda even had kids together makes it super funny to me that we did see her on The Flash (played by the awesome Malese Jow), only it was as a love interest for Barry before he and Iris got together and got serious about each other. Wally paved the way for Barry to “Enter Flash Time” and I think it led to a pretty spectacular episode this week!